It seems that the days of exploding Samsung phones are still not behind us as a Nigerian Samsung device user recently took to Twitter to reveal that his Galaxy S7 edge caught fire without any provocation. This isn’t the first time a Samsung device has allegedly gone up in flames. If you remember, Samsung had to discontinue the Galaxy Note7 line after multiple users reported exploding incidents. Even after the Korean giant replaced those cells, the problem persisted, forcing the company to ultimately end production and bear a massive financial loss. 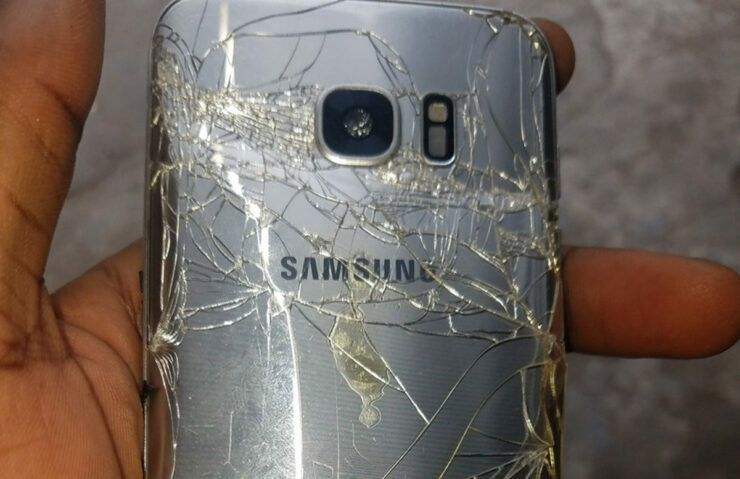 According to the Nigerian user, his Samsung Galaxy S7 edge went up in flames out of nowhere. It’s worth mentioning that the phone wasn’t being charged at that time. The user has also uploaded pictures to back up his claim, with the images showing damaged the front and back panel. Looking at the images, it appears that the explosion originated from the place where the battery is usually located. To stop things from exacerbating, the user doused his Galaxy S7 edge in a bucket of water. The user further added that the phone was simply lying on a table when it caught fire and he wasn’t using it at that time. In normal circumstances, dumping a phone in a bucket of water would not have been the smartest of decisions, but it was necessary here. Samsung South Africa is aware of the issue and has asked the user for more information so the problem can be resolved. The user would presumably send the device to Samsung so that the company can investigate the reason behind the explosion as determining the cause because just looking at the posted pictures is not sufficient. It remains to be seen if Samsung will make its findings public, but while the company probes the issue further, it seems like the battery is to be blamed. Apparently, the Lithium-ion polymers batteries are vulnerable to random failure. Previously, users of Xiaomi and Motorola have reported similar problems so this problem is not limited to Samsung alone. As a reminder, when charging a device, you should make sure to use certified accessories, or your phone or tablet might meet a similar fate.